Tuesdays are my "popcorn date day" with my husband. I put my card making supplies aside (that's hard to do) and go see a movie! This is the card I made yesterday with a Penny Black Stamp called "Hanging On." The width of my card is cut short so that the mouse is cut out and hangs over in front of the inside page. 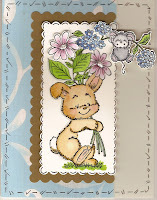 I think the bunny's smile is so cute and I hope this card puts a smile on your face as well. Enjoy your day ... I'm off to the movies! It's fab Donna. Love the way you have cut the image. Hope you saw something good! Love this card, that image is adorable. I see stamping has taken a good hold of you!